This new high-definition Blu-ray of 1974's Dark Star is the third version of the John Carpenter-Dan O'Bannon cult classic I've reviewed from VCI Entertainment, so I won't synopsize the story again (you can check out my last DVD review here). This new "Thermostellar Edition" Blu-ray version features a newly remastered 1080p HD, widescreen 1.78:1 transfer of the 83 minute "theatrical cut." 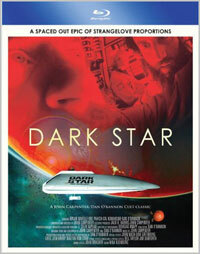 Originally shot cheaply on 16mm film and then blown up to 35mm for theatrical exhibition, Dark Star has never really looked all that good, and even with the extensive work put into this Blu-ray, it still doesn't look particularly good. But it is a noticeable improvement over all previous home video releases, with brighter, more stable colors and significantly better contrast. The overall image is still frustratingly soft, and it looks like it may have been subjected to overzealous digital scrubbing to eliminate visual "noise." Faces are unnaturally smooth, and there is very little fine detail or textures evident anywhere in the movie. That all said - it's still the best-looking presentation of the film I've seen, including the one theatrical showing I attended years ago. The Bonus Features are identical to those included on VCI's previous "Hyperdrive Edition" DVD: an audio commentary track by "super fan" Andrew Gilchrist, an on-camera interview with science fiction author Alan Dean Foster, who discusses the challenge of writing the film's novelization back in the 70s (as well as the rest of his career), a 3D Visual Guide to the Dark Star spaceship, an interview with actor Brian Narelle (Doolittle), text trivia, and the original theatrical trailer. Missing from this edition is the shorter, 68 minute "student film" version of the film, which means that I'll probably be hanging onto my old DVD just for completion's sake. If you're a fan of the film and have a Blu-ray set-up, it's worth picking up. Picture and audio quality are better than previous editions, and while the visual quality can't match the HD transfers of its big-budget studio contemporaries (never mind today's digital spectacles), it's probably the best this particular film is likely to look for the forseeable future. I'll definitely be getting this, but like you, I'll be keeping my original DVD too.